When you start looking for THE perfect dog food, what aspects of the pet food make it the “perfect” choice? Is it the research behind the formula? Reviews from other customers? Industry leader backing? Purina Pro Plan dog food is one of the top leading brands in the dog food industry. Why, you might ask, is Purina Pro Plan top of mind for many dog owners when they’re searching the aisles of their local pet supply store? Purina has been around in the pet food industry for a substantial amount of time and has accumulated over 85 years of documented research on the best ingredients and formulas for your best furry friend. Purina also prides itself on being able to confidently say the #1 ingredient in their food is meat, something not all of their competitors can claim. It’s also important to note that Purina has veterinarians and nutritionists on staff to help ensure the quality of food that is being produced and served to Fido is top-notch and healthy. After careful consideration and analysis, we have awarded Purina Pro Plan a rating of 5 stars out 5 stars. According to consumers on popular e-commerce sites such as Amazon.com and Chewy.com, dog tails are waggin’ and lips are smackin’! With doggie approval, customers are raving about the fact that their pups enjoy the taste of the food and the customers enjoy the price tag on the bag. 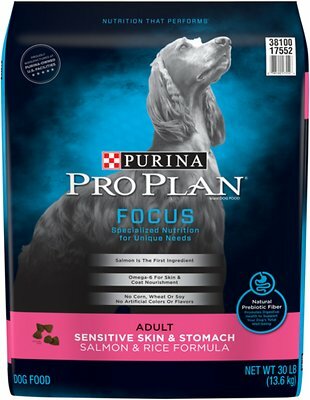 One customer even stated that Purina Pro Plan dog food was recommended by their cardiologist—this testament speaks volumes about the quality of dog food that is produced by Purina. So let’s talk pros and cons, shall we? These Purina Pro Plan reviews show some very interesting aspects of the beloved dog food that all pet owners should know. Customers reported feeling very pleased with the price point of the dog food. One customer even stated that the food was “great quality and not horribly priced”. When customers search for the best food for their furry friends, they want the best quality they can find without having to break the bank. Purina Pro Plan does just that. Fido will let you know when they dislike their food - they won’t eat it! But customers say that their dogs love the taste of Purina Pro Plan and are excited for meal time. With great taste and quality ingredients, this dog food is sure to provide your pup with the best of both worlds. Our canine friends are used to having skin issues, just like humans. Certain ingredients can aggravate a dog’s skin and cause rashes and reactions. Customers reported that before trying Purina Pro Plan dog food, their dogs experienced rashes and severe itching. After trying Purina Pro Plan, the dogs saw no more rashes and the itching disappeared. 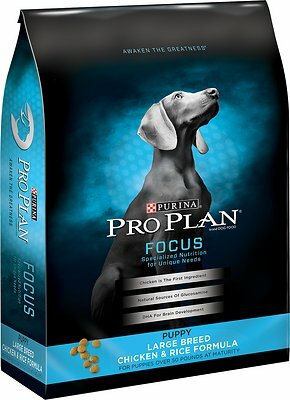 Unfortunately, within the recent years, Purina changed its formula for many of their products, including the pro plan line. Customers have sent in reviews stating that their dogs loved the older formula but hate the new formula. Reviews on Amazon.com have stated that Purina Pro Plan has produced some stomach issues for puppies including gas, loose stools, and bad breath. While this was not a common complaint, it is something to be considered when giving your dog with sensitive stomach this particular dry dog food. This chicken and rice formula dog food provides your pup with antioxidants that support growth and development. DHA is also included to help give your puppy the best support for their growing brain and vision. Customers gave this particular dog food formula 4.5 out of 5 stars on Amazon and Chewy. Strong muscles and high energy are important for any growing puppy and Purina Pro Plan ratings show that this wet dog food provides high protein from chicken in the formula. Because your dog has a very sensitive stomach at this young age, Purina Pro Plan’s Focus puppy food is easily digestible and is packed with prebiotic fiber to help give those intestines the best balance possible. Customers rated this product 4.8 out of 5 stars on Chewy.com. With a 4.8 out of 5 stars on Chewy.com, the Purina Pro Plan Sport All Life Stages dry dog food is a customer favorite for all the beloved doggies in your life. Whether they are puppies or senior dogs, this dry dog food will help your dog keep that lean muscle that keeps them healthy. Dogs need a lot of exercise and this particular formula is made with that in mind. Endurance is a key element to a healthy dog and Sport All Life Stages dry dog food does just that. There is nothing more important than keeping your furry friend happy and healthy and one of the ways that dogs suffer is with skin and stomach issues. 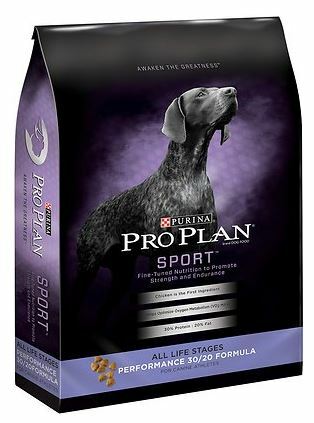 Purina Pro Plan reviews show that this unique formula has added zinc which helps to give the skin and coat a healthy appearance and texture. Prebiotic fiber is also included to help increase intestinal balance. With over 400 reviews on Chewy.com, customers gave this formula a 4.6 star rating, with highly complementary and satisfied comments regarding the food’s promises and delivery. Some dogs prefer the texture of a wet dog food and Purina Pro Plan has plenty to choose from. 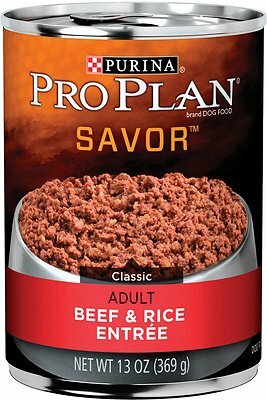 One of the top performing and rated wet dog foods made by Purina in the Pro Plan line was the Savor Adult Classic Beef & Rice Entree. With real beef as the first ingredient, Fido is guaranteed to get top-quality food. Customers rated this particular wet dog food 4.8 out of 5 stars on Chewy.com. Purina Pro Plan prides itself on providing real meat and not using poultry by-product meal as the top ingredient in all of their dry foods. Because fillers, corn gluten meal, and chicken by-products are used so frequently in dog food, Purina Pro Plan takes careful consideration into finding real meat to use as the top ingredient for high-quality protein and a great source of vitamins. The ingredient lists also show the use of prebiotic fiber and vitamins to help promote healthy and happy dogs from puppies to seniors. According to the FDA website, there have been no recalls on Purina Pro Plan. So if you’re asking yourself is Purina Pro Plan a good dog food for your pup, the answer is yes. Purina has been a staple in the dog food industry for many years and customers are raving about the quality of food along with the affordable pricing of this well-known dog food. We take a look 2 puppy formulas (one wet and one dry), as well as 3 adult formulas (two dry and one wet) that were top-rated by customers like you. 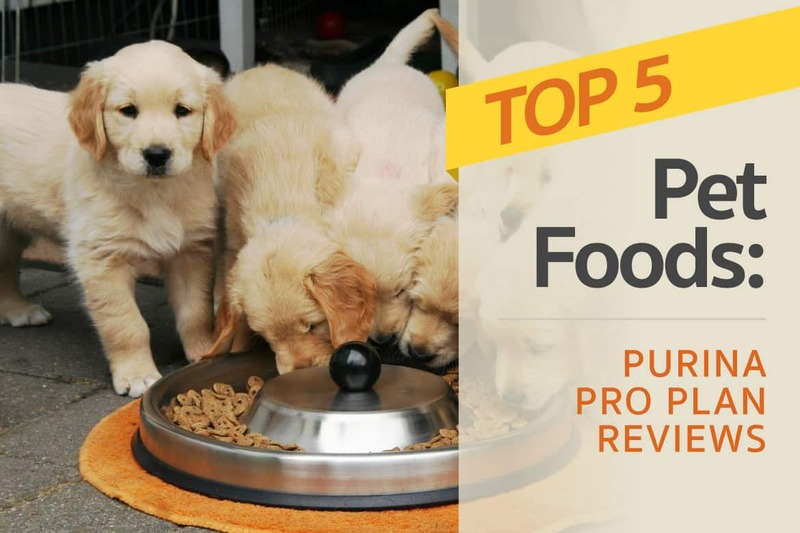 Take a look at an analysis of the ingredients, pros and cons and recall history in this article with Purina Pro Plan Dog Food reviews. Your dog will thank you for taking the time to invest in their health and wellness.